Disney UK unfortunately isn't streaming movies. Yet. Want a way to keep the kids happy this summer for free? And you live in the US (or at least know how to use an IP blocker)? 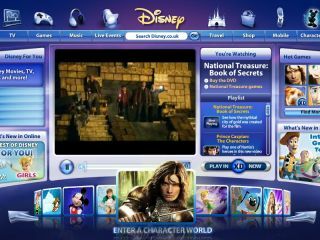 Then plop them in front of the internet, point your browser to Disney.com and let them watch a Disney film for free. It’s a move that the Mouse House has taken to celebrate ABC’s upcoming series ‘Wonderful World Of Disney’ that’s showing every Saturday night throughout the summer. Much like the BBC’s iPlayer, the films will become available on Disney.com for a week after they are shown on TV. Paul Yanover, executive vice president and managing director, had this to say about the link-up with ABC: "This is a wonderful partnership with ABC, and just another example of how Disney's unmatched, high-quality content can be leveraged on multiple platforms." The movies that will be streamed, on an albeit temporary service, are: Finding Nemo, Monsters Inc., Freaky Friday, Haunted Mansion, Confessions of a Teenage Drama Queen, and Peter Pan. The online freebies have already started with Nemo and continue all the way up to 8 August. We have contacted Disney about the possibility of the service coming to the UK, but are awaiting a reply.